Bay has lived in Louisburg her entire life, raising her daughter as a single mother after being widowed at a young age. Her sister, Tansy, left the small town as a teenager to lead a glamorous and luxurious life, staying away and not even returning to attend their mother's funeral the year prior. When Tansy shows up unexpectedly, Bay, arguing constantly with her teenage daughter, Ashley, becomes aggravated when Tansy befriends her with ease, adding to the tension of her lengthy absence. When a family crisis ensues, the sisters are forced together, but the closer they become, the harder it is for secrets to remain buried and mistakes of the past threaten their budding relationship all over again. Her Mother's Daughter is a novel about family, friendship and sisterly bonds and is full of past mistakes, dark secrets and the love that binds. When I first read the synopsis, I was expecting a great small town family drama, and I wasn't disappointed. I haven't read a novel recently that tossed me in so many different directions. I felt like I was on a fishing boat in the harbour watching the drama unfold ashore. I was impressed that I didn't see many of the twists coming and as I've mentioned before, I love an an unpredictable book. I didn't even want to include this in my review because I didn't want you looking for them, but it was my biggest thrill with this novel so I had to mention it. There are strong female characters in this novel and we follow each of them as they work through their own issues - which were all so different, yet came together in a rich tapestry. Bay is still troubled with the loss of her husband and father at a young age as well as her sister's disappearance and her mother's recent death. Tansy struggles with the guilt of abandoning her family and not returning after many years, as well as a secret that haunts her that was the reason she left in the first place. Ashley is riddled with teenage angst and Gertie, struggles with her weight and lack of male suitors. I loved Gertie's character and giggled frequently at scenes she was involved in and loved her warmth and bubbly personality. I also enjoyed that Ashley was given such a large role to play, having frequently read novels where daughters are just secondary characters. Although Bay and Tansy share a large part of this story, Ashley wasn't shuffled off to the side and many scenes are narrated through her eyes. An air of mystery surrounds this novel and it moves at a rapid pace with just the right amount of information doled out with each turn. I was intrigued with the family dynamics and even without having grown up with a sister myself, I could still relate to these characters. I fully understood their motives, their relationship and what drew them together and had them falling apart. The small fishing town setting is portrayed with just the right amount of description. There isn't much in the way of glamour in this novel, except a few scenes in the beginning with Tansy, so if you're used to women's fiction where designer shoes play a prominent role, don't expect to find that here. Instead you'll find a rich character driven novel about family dynamics, which I found a refreshing change of pace compared to all the designer laden chick lit I've been reading lately. 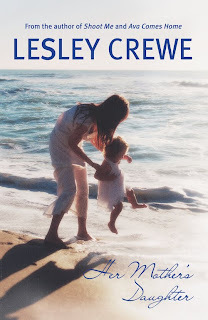 I thoroughly enjoyed Her Mother's Daughter and will definitely seek out other Lesley Crewe novels. If you're looking for a great family tale full of sisterly drama and small town antics that is full of twists, pick up this novel today. You won't be disappointed. At first this gently narrated story seemed like it was going to just meander on through to the finish but the intricate storyline crept up on me and I’m sure it will do the same for most readers. I didn’t find that there was anything very dramatic about the dialogue or writing style but the little details that are leaked out along the way end up creating a complicated story once you realise what’s actually going to come together. I found it interesting that I couldn’t decide which of the women I was most empathetic to during the read which implies that there was equal voice given to each of the three main female characters, and perhaps we aren’t meant to choose a voice to follow which leaves us open to empathy for each of them? 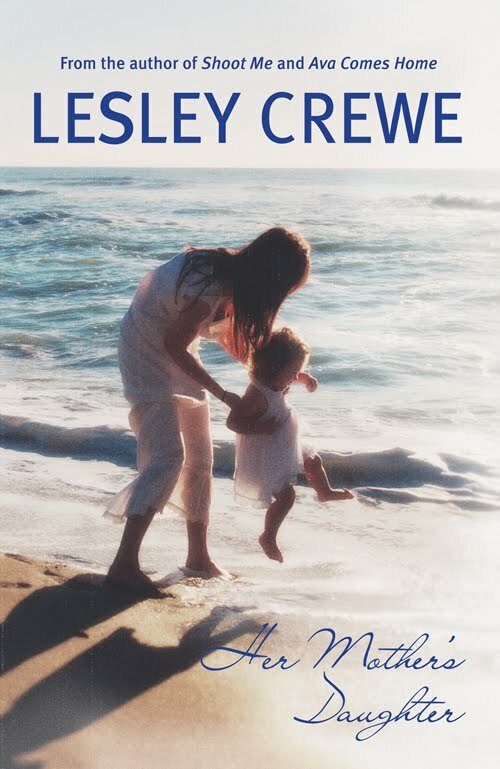 I found it a bit trying to give Tansy the benefit of the doubt especially when she’s obviously still so torn about being at home but it’s a credit to Crewe’s story telling that I didn’t just write her off from the start. There are some gut-wrenching moments for Tansy and my heart broke for her a couple of times. It’s impossible to imagine how Bay and Tansy’s mother thought her decision would be best for everyone- in the end she did what she thought would be least painful I suppose. Crewe does also give us some memorable moments with the friends and additional personalities so there are definitely some lighter and funnier scenes to go along with the somewhat intense plot. I loved Bay’s best friend and thought she really kept the family together and I also liked the nosy neighbour- she just brought us back to real life and also gave us another link to the mother. All in all I really enjoyed Her Mother's Daughter and would like to try another! Thank you to Nimbus Publishing for our review copy. All opinions are our own.